I have always spent Easter Sunday with family sitting in my comfortable suburban home, enjoying a lamb roast. This year I found myself sitting with 700 or so members of the Australian Tamil community outside Kirribilli House. It was a protest against the Sri Lankan government's ongoing attacks on Tamil civilians in northern Sri Lanka. I was attending a conference in Sydney when the word went out that the Sri Lankan government had commenced an attack on the so called civilian 'safety zones' in Sri Lanka — areas that the government has designated as safe for civilians, refugees in their own country. Despite the complexities of the Sri Lankan crisis, I could empathise with innocent civilians being attacked in their own land. So I headed down to Kirribilli House in solidarity with the Tamil people. Sitting in the crowd, I witnessed whole families, groups of teenagers and single women and men all pleading for the same outcome, as they chanted 'Australia save the Tamils'. Not wanting to wake nearby sleeping Sydney-siders the protesters kept their voices down. But the message was clear: 'We want freedom'. Tensions between the Sri Lankan Sinhalese government and the minority Tamil people are not new. According to Dr Brian Senewiratne, a physician from the Sinhalese ethnic majority and activist for Tamil rights, policies have been implemented for decades that make it more difficult for Tamils to access education, jobs and other essentials of existence. Dr Senewiratne, speaking at the protest, referred to the Tamil people as 'my people', reflecting a common humanity that defies ethnic and religious origins. In recent months the crisis has escalated to a catastrophic level. According to Amnesty International statistics, 200,000 people are trapped in the midst of heavy fighting, resulting in hundreds if not thousands of civilian deaths. The Sri Lankan government state they are fighting against the LTTE (Liberation Tigers of Tamil Eelam, or Tamil Tigers), which they consider a terrorist unit. They believe their cause is worth the countless civilian casualties, whom they consider collateral damage. To some the Tamil Tigers are the people's only defence against a brutal and genocidal regime. To others they are a terrorist organisation in the vein of Al Qaeda. In the current world climate, the existence of alleged terrorist organisations or governments has been the impetus or the excuse required to start wars, invade countries and kill countless innocent human lives. The Australian Government has thrown its backing behind these wars, supporting the United States in Afghanistan and Iraq. As justification for its involvement, the Australian Government points to the suffering of the people in these countries. Why then has the suffering of the Tamil people been met with a deafening 'no comment'? 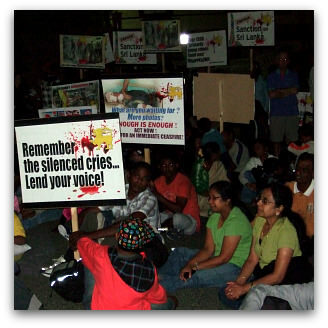 As hundreds of Tamils braced the night outside Kirribilli House, and three men undertook a hunger strike in a plea to be heard by Kevin Rudd, no acknowledgement of the suffering of these people was forthcoming. With journalists prohibited from Sri Lanka and aid agencies expelled, the truth of what is occurring can seem intangible. What is clear is that aid, medicine and food are not available to refugees. Also, that Sri Lanka's lucrative port access to the Indian Ocean is an issue influencing how countries such as India address the crisis. Christian churches, Hindu kovils and Muslim mosques are routinely targeted. Dr Mayuran Suthersan, a member of the Australian Tamil Youth and a doctor practicing in Sydney, said at the protest, 'we receive word that our brother, sister or mother has died and these words come too often ... the Tamil people are being annihilated'. Earlier in the day I had heard of an orphanage that had been bombed under the pretence that the children living there were potential terrorists. Sitting in the crowd I met a teenage boy the same age of some of those now dead children. I asked him if he had family in Sri Lanka. His answer, 'not directly', seemed to encapsulate the feeling of the crowd, that the people suffering in Sri Lanka were family whether they were related or not. It was a fitting sentiment on the day when Christians in Australia were sitting in their living rooms reflecting on the suffering of their leader, who had stood up for the oppressed and marginalised, and for whom all people were as family. Natalie Francis is a social worker, an activist with the Australia-Venezuela Solididarity Network, and a member of a post church faith community. She has an an Arts degree with a major in Cultural Theory and English Literature. Natalie, I appreciate you taking an interest in Sri Lanka but the issues are a lot more complicated than what you may have heard from one side alone. I encourage you to speak to a non-tamil Sri Lankan and ask their thoughts as well before coming to a conclusion definitive enough to write a outsider's guide. The LTTE (Liberation Tigers of Tamil Eelam) have subjected the Sri Lankan people to misery for the last 25 years. They are responsible for over 70,000 deaths and the FBI has labeled the LTTE the deadliest terrorist organization in the world. Right now the government has a rare opportunity to remove this terror from the country forever. In the East, they have done this already, and a minority Tamil leader (who used to be a child soldier with the LTTE) is now the Chief Minister of that province. Yes, civilian deaths must be avoided but it is the terrorists who are holding these civilians as hostage (human shield as the UN called it just a few days ago) and preventing them from leaving the conflict zone. I hope you will take another look and not believe a one-sided story. You can read more about the terrorist group that has systematically targeted non-Tamils (both Sinhalese and Muslims alike) on the FBI page here. I really touched by your words. I'm really pleased our voice has been heard by at least one person. Brian Senewiratne who is referred to in the article is a "non-Tamil Sri Lankan". There is nothing about being Sinhalese that automatically means you are chauvinist. All you need is basic humanity to stand up against slaughter of innocent people. I find it very difficult not to believe the Tamils who are protesting from all over the world. Protests from Australia to Canada are all calling on the Sri Lankan government to stop the war. Hard to believe that the claims protestors are making against Sri Lanka are propaganda. Why not get our independant aussie reporters in there to verifiy? It is indeed tragic that the civilians are trapped in the NFZ declared by the Govt of SL. They are there because the LTTE is keeping them by force. The 2 day cease fire by the Govt proved it. Natalie please google 'LTTE atrocities' to see the 'otherside of the hill'. The Govt of SL has a duty by the civilised world to disable this Terror Outfit for all time with minimum Civilian casualties.The SL army is doing it and the LTTE backers cannot stomach it any more. I am a Sinhalese catholic who has spent the good part of four decades in Australia. I keep in touch with what is happenning in Sri Lanka. Natalie you have heard one side of the story and have made an impassioned plea. I would challenge you to do some research and you will find that the story is much more complex. Loss of life is distasteful and the LTTE have been killing many innocent civilians and are at this moment using them as human shields. I can see your dedication and your fervour but please do not make excuses for the organisation that invented suicide bombers, I urge you and others to read. Like Brian Senewitratne and many others I too am appaled at the inhuman suffering inflicted on civilians. However, much of this has been and still is the direct result of the LTTE and their agenda to regain the upperhand in their pursuance of a fragmentation of the island nation of Sri Lanka(SL). To put their agenda into a context you and most Australians can conceptualise I pose this qn. How would you and the average Australian feel if in 20, 50 or 100 years from now the Vietnamese or Chinese or even say the Italian or Greek diaspora living in Oz wanted Tasmania or the NT to establish a seperate nation of their own and used terrorist tactics to that end? These international protests have one purpose behind them: that is to bring pressure on the SL government to order a ceasefire long enough for the LTTE to re-group, re-arm and continue their atrocities so that eventually their dream of an independant Tamil Eelam will materialise regardless of the cost in human lives. Tamils are shocked & concerned by the ongoing humanitarian catastrophe in the North-East of Sri Lanka and the lack of action by the the international community. The Sri Lankan State is engaged in a genocide of the Tamil people of the island. The Tamil people have the right to determine their own destiny. The Tamil people have mandated the establishment of a free, sovereign state of Tamil Eelam as the only enduring solution. Those who accuse Natalie of being 'one-sided' are also being one-sided. The difference is that while they are sympathetic with the majority, her argument is sympathetic with an oppressed minority. Good on you Natalie, it's a great and challenging article. If you say Sri Lankan Government ever worried about civilians. you should have the answer for all the genocide happened to tamils from 1950.
where did u get the 70,000 from? Yes nowhere in the world, its possible to label a government as terrorist. If that possible Sri Lankan government would come first in the row. Can you answer why journalist are not allowed to the war zone. Don't say government is worried about their life. Common these journalist never worried about their life during Iraq or Afghan war. So you can let them go inside, if you are not worried that truth could be revealed. Why is the International Community or UN still watching silently the slaughter of innocent, weakened, starved, homeless, tired and injured children, women and men? It is the SL Army now on the offensive. Do people still believe in God? Atrocities by Sri Lankan Govt is documented at this link. I like this article. If it is on-sided, that is its strength, not weakness. Perhaps the title was too easily misinterpreted. I can no more fathom the complexities of this crisis than many other international and inter-ethnic conflicts around the world. But I can relate to going to a protest and being impacted by stories of human suffering. Not to take away from the human crisis discussed, but the article was also about Easter. Where, in this situation, is that unique political position that Jesus stood in before he was executed for it? There were many passionate factions that would have gladly solicited his allegiance to their cause. None succeeded, but all succeeded in gaining his compassion. Especially those who suffered under the regimes of others. Perhaps we can hold whatever political position or ideal we like, but is our first allegiance to find that elusive political position Jesus held without co-opting it in the name of one or another human regime? Not to take away from the human crisis discussed, but the article was also about Easter. Where, in this situation, is that unique political position that Jesus stood in before he was executed for it? There were many passionate factions that would have gladly solicited his allegiance to their cause. None succeeded, but all succeeded in gaining his compassion. Especially those who suffered under the regimes of others. Perhaps we can hold whatever political position or ideal we like, but is our first allegiance to find that elusive political position Jesus held without coopting it in the name of one or another human regime? this is also the most unbiased article I have read. a careful analysis of this article reveals neutral, unbiased attitude of Natalie. It's not biased towards the Sinhalese or the Tamils. I (as I am sure other Tamils would be) am very grateful to Natalie for her effort. Thank You very much Natalie! The situation in SL is critical. Our (Tamils') hearts are weighed down with so much sorrow seeing how much suffering Tamil people are going thru today. We hope and pray God/Jesus will eliminate evil soon and punish the Sinhala Sri Lanka Army for it's crimes against humanity. a very commendable piece of writing indeed. Thank You for writing this Natalie. I urge everyone to visit the following websites for a better understanding of Sri Lanka.